Have you recently noticed your car pulling to one side? Are you experiencing irregular tyre wear? Have you recently had a hard shock by hitting a kerb or driving into a pothole? These are all common indicators of incorrect wheel alignment. Here at Tyred and Exhausted we provide 4 wheel alignment Aylesbury, ensuring that all of your wheels are correctly aligned based on the manufacturer’s specifications. Driving with misaligned tyres can result in increased tyre wear and fuel consumption. What Does 4 Wheel Alignment Aylesbury Involve? The process of correctly aligning tyres involves making sure all wheels are at the optimum angle to ensure the car drives straight and handles well. The toe of a tyre is how far the tyres point inwards or outwards. A positive toe (or toe in) means the tyre points inwards towards the centreline of the vehicle. A negative toe (or toe out) is the opposite and determines how far outwards the tyre points away from the vehicle. The camber angle is how much a tyre leans vertically towards or away from the vehicle when viewed from the front or back of the vehicle. Negative camber means the top of the tyre is leaning towards the car. Too much negative camber will cause increased wear on the inside edge of the tyre. Positive camber means the top of the tyre is leaning away from the car. Too much positive camber will cause increased wear on the outside edge of the tyre. Not all road vehicles are able to have their camber adjusted. Caster is how far forward or behind the steering axis is to the vertical axis when viewed from the side. 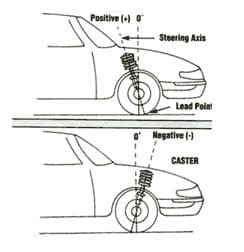 Positive caster is when the steering axis is in front of the vertical axis and improves the stability of the car when driving in a straight line. Negative caster is when the steering axis is behind the vertical axis and is usually only on older vehicles, modern cars use positive caster. Correct alignment of your tyres have many benefits including better handling and safety, increased tyre life and reduced fuel consumption. Tyres can last thousands of miles longer when correctly aligned so it’s important to check your alignment periodically and after any hard hits on kerbs, potholes or speed bumps. To make sure your wheels are correctly aligned call Tyred and Exhausted today on 01296 432552 for the best 4 wheel alignment Aylesbury!